Summer's heat is always welcome at first, but it can become oppressive; by mid to late August, you're probably more than ready make your escape from the heat and the humidity and take a vacation somewhere a little cooler. If it's cool you're after, then here are three words you're going to love – Canadian polar bears! With average July and August highs hovering just below 60 degrees Fahrenheit, the Hudson Bay, Manitoba region is as welcome as a cool breeze on a hot summer's day. A visit to the Hudson Bay region in summer offers refreshingly cool weather and the opportunity to see Canada's famous polar bears and other Canadian wildlife up close and personal in the ruggedly beautiful tundra and taiga landscapes of the Hudson Bay, MB coast. If you'd like to give your air conditioner a break this summer and see Canada's favorite carnivores at close range, Canada Polar Bears can help you choose Canadian vacations which make lifelong memories. Your summer Canadian polar bear retreat begins at Manitoba's famous Nanuk Polar Bear Lodge. You can only reach the lodge by plane and the flight gives you a bird's eye perspective on the Hudson Bay's polar bear habitat; be sure to bring a camera since you'll certainly want to take lots of pictures now and later on. You can familiarize yourself with the terrain after your arrival in the early afternoon. After dinner, you'll spend your first night at the Polar Bear Lodge learning about Canada's polar bears and other wildlife of the Hudson Bay, Manitoba region with lectures and video presentations. If the weather permits and there are clear skies, you may be treated to the natural spectacle of the Northern Lights! This is a treat which would be worth a visit to Canada in its own right and is certainly a welcome addition to your Canadian polar bear trip. After breakfast, you can take ATV excursions to the Hudson Bay's tidal flats. You may see polar bears as you explore the landscape; even if you decide to skip the ride, polar bears are frequent visitors to the lodge as well! It's not uncommon to see several polar bears just over the lodge's fence on any given day. There are all day polar bear photography trips, allowing you to get close enough to take incredible photos of these majestic animals. You may well be able to experience the unforgettable sight of polar bear cubs at play on these outings, as well as encountering other tundra wildlife including moose, fox and Canadian waterfowl – and in the evenings, you can marvel at the Northern Lights! This is a Canadian vacation which always ends sooner than you like; but Canadian Polar Bears can help book your next summer vacation to the tundra of the Hudson Bay, Manitoba - home of the polar bear. 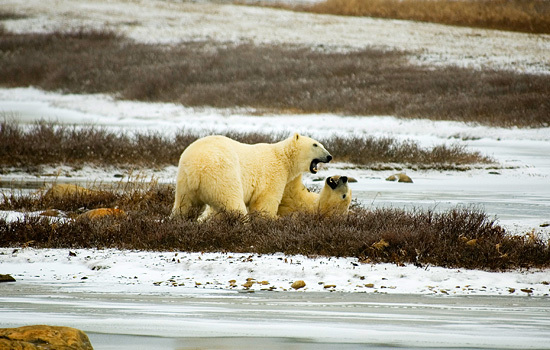 Need more information on Visit Polar Bears On The Tundra Along Hudson Bay? Talk to one of our Canadian travel Insiders who'd be happy to answer all your questions. What is Happening to the World's Polar Bears? Ready to start planning your Polar Bear tour? Get your personalized trip plan and all your questions answered by our friendly, knowledgeable Canadian Insiders.